This year, Prasanna has brought five of his disciples to introduce during the music season in Chennai. In his first concert at the Bharatiya Vidya Bhavan on Dec. 8, 2015, young Raghav played along and surprised the audience. At the second concert of the season at Arkay Convention hall on Dec, 12, Prasanna brought another young disciple Gokul on to the stage. 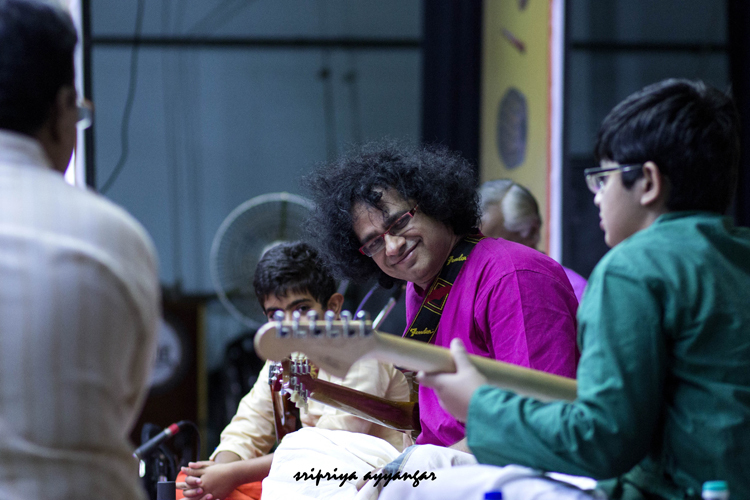 The cozy hall witnessed cheerful music from the guru and the sishya. 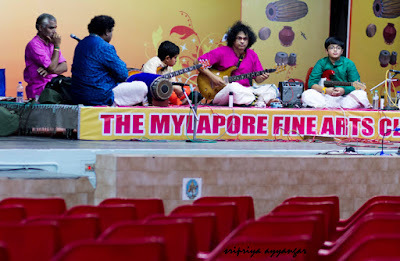 And in the third at the Mylapore Fine Arts Club on Dec. 13, both Raghav and Gokul, fully recovered from jet-lag, accompanied their guru and it was a riot of musical notes that evening. The young artistes received big applause. The next one is coming up for Naada Inbam at Ragasudha Hall on Dec. 19, 2015. Take along your children to listen to some Carnatic music on a Western instrument by young people from abroad. It is nice to see the kids of this era pickup a lot of interest in carnatic music. It requires a big heart from Gurus to let their disciples share the stage - something that is very rare.